Madhya Pradesh Professional Recruitment & promotion (MP PPT) Exam Hall Ticket 2017 : Madhya Pradesh Professional Recruitment & Promotion Board (MPPEB) is scheduled to conduct Pre Polytechnic Test (PPT) on 18th June 2017. 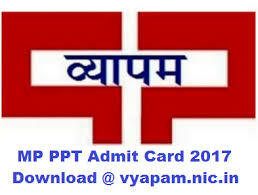 Admit Card of Pre Polytechnic Entrance Test released through the official website of Madhya Pradesh Examination www.vyapam.nic.in. The MP PPT exam date is scheduled on 18th June 2017. Candidates can download the MP Vyapam Pre Polytechnic Test Admit Card 2017 from the direct link and MP PPT Call Letter 2017 from the link below. The Madhya Pradesh Pre-Polytechnic Exam is organized by the Madhya Pradesh Professional Examination Board (MPPEB). In the below table we have given the detailed information related to MP PPT Syllabus along with Exam Pattern 2017.MP PPT is also known as Madhya Pradesh Pre Polytechnic Test. It is a state level polytechnic exam. The MP PPT exam will be organized for providing admission to the government and non-government polytechnic colleges in the Madhya Pradesh State. · Candidates are required to visit official website of organization that is www.vyapam.nic.in. · Now on the home page, applicants need to go to the “important information” section and hit on the suitable link. · Then proceed if you have opted specified exam centers and enter relevant details such as Registration ID and Roll No or name. · If any candidate forgets Roll No. then please enter Name, Father’s Name and Date of Birth. · Click on “submit” tab and your Vyapam Admit card will appear on your computer screen. · Download the PDF file and take a print out of it for the entrance to the examination hall and save it for future use.